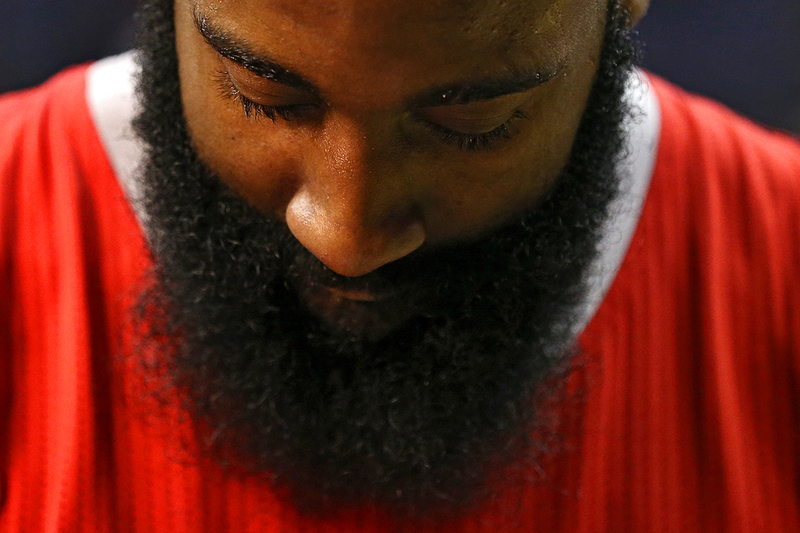 "James Harden #13 of the Houston Rockets looks on after defeating the Washington Wizards, 99-91, at Verizon Center on March 29, 2015 in Washington, DC." The other day, I was mentioning to a friend that there are so many people in the world that have distinct appearance traits that make them stand out and they rarely ever change. Whether it's a hair style, a type of hat or style of glasses. These small visual cues help them stand out amongst others and help others remember something about them. The world of sports is no different. James Harden of the Houston Rockets is a beaming example of how something as simple as a beard can attract attention of fans. His facial hair is something of an iconic staple in the NBA - after all - fear the beard is a slogan that follows the hoops star. These traits also attract the lens of photographers. Following the game between the Rockets and the Washington Wizards, while other photographers went to file their end of game pictures, I waited for Harden to be interviewed by television. A mundane moment to others, I often use these instances to shoot portraits of superstars I normally wouldn't get the chance to do otherwise. In this case, I waited for the moment I had preconceived to candidly unfold, worked with the light of the television camera and clicked the shutter.